Up until six years ago the Calvary Baptist Church was located at another location and they were considering a new build. But then they found this beautiful historic Presbyterian Church located at 2306 Waller Street. A small group of persons attended at that time and the opportunity arose for Calvary Baptist to make a purchase. Beverly, Stephanie Neff and I recently were awed by the beauty of this church and the friendliness of those within. Leading the congregation is young Ryan Brown. I might add he is young in spirit as well in age as he also coaches local youth in soccer. I talked with Tony Lauro attending that day who is a local professional engineer and he said that Calvary was fortunate to be able to purchase this beautiful church. The Pastor later said the church makes a balloon payment each year with that time coming soon. Extensive remodeling has occurred but the historic texture has not changed. The original plan by the congregation was to pay off the church in seven years and they are on track to do that next year! We would enjoy coming to their mortgage burning party when that occurs shortly. The church also sponsors a radio ministry which includes programming called: Because of Calvary which airs weekdays at 12:20 p.m. on 99.3 WNXT and weekdays at 8:20 a.m. and 5:20 p.m. on 98.3 WPAY. This week at Calvary airs on Sundays (1260 WNXT) at 9:05 a.m. Because of Calvary airs at 10:00 a.m. on the same channel. It airs again on 95.7 WNXT at Sunday at 9:00 a.m. Giving today’s bible message was the church Pastor who talked with us following the service. Though in the service I learned of his love of farming and cattle in his sideline business I also learned of his interest and connection to 4-H. 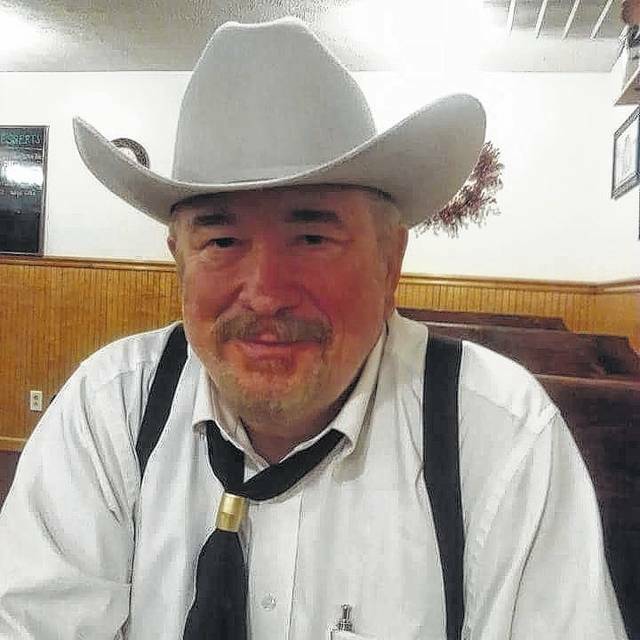 He said a guy attending a cattle show along with Pastor Brown had told him he listened to the Calvary programs via radio. He went on to say that the church outreach radio program which includes online airing at fbn.com reaches into 110 countries with England being the number one listening audience a week ago. Roger Blevins who suffered serious injuries in a traffic accident and having an only 1% chance of survival will be speaking to the church at their regular service on October 7. From this tragic experience he shares his ministry of his healing and relationship with Christ across this country. He continues to serve as the South American Field Director with Baptist International Missions, Inc. though is residence is in Harrison Tennessee. Also mentioned in upcoming events was a service on October 14 at 10:35 a.m. which is known as “Friend Day.” The Pastor said this is one of the church’s biggest days of the year and a meal will be served following the service. The church of course encourages all to attend and bring a friend. If you don’t have a friend who attends this church you can tell them that I am your friend and invited you to attend. They will welcome you warmly as they did us! I found it very interesting that the church is working to get their Sunday School messages transcribed into 13 languages. Sounded like a big undertaking but a fabulous ministry extension for sure. Three groups of children from their Sunday School classes came forward and donated to the church building fund. These funds appeared to be raised by the children this same morning during their classes held earlier. It was a very heartwarming exhibit of generosity toward their church payoff project. Count me in as a believer of including the children hands on in projects of this nature at church and at home. A great life lesson. The Pastor mentioned Chanston Bryant, who participated in the service saying that as a local football player he was known as the refrigerator. Calvary Baptist has a very talented choir. Several of their offerings included “At the name of Jesus” and a special titled, “Heaven came down medley.” Special music was provided by Wendy Rawlins. Sometimes we have surprises in our visits. A friend of ours Shirley Conklin, friends through the Clay Alumni Association but now living in North Carolina and only in town a few days was present at this service, but we had no idea she would be there. She schedules a day to meet friends at a local restaurant for lunch on one day of her visit. Beverly was able to attend and had planned to in advance. We could have gone anywhere today but chose Calvary. The Lord works in mysterious ways. We met the Pastor’s mother Janice Griffin Brown. She told me that her husband, Dan Brown knew me having purchased equipment from me as the auctioneer at the Rubyville and Rosemount Clay School auctions. He had purchased material to remodel the Calvary Baptist restrooms. This is the second group I have come across that secured supplies from the demo of these Clay Schools, the other I know of having been Notre Dame High School. Makes me feel good as it was rather a sad experience for me being close to the Clay Schools, conducting a sale right down to the hardware and watching by the days end the destruction of each as the buyers secured their purchases. So out of the rubble came new life in a way. Also in our visit we got to see several other Minford residents, Dennis and Dianne Bennett. I have in the passed discussed with her my portrayal of Thaddeus Bennett, the founder of Minford Ohio with Minford third graders on an annual basis. Dianne is an ancestor! Today’s service Bible message was a discussion on Romans 14:1, 15:1 titled, “Him that is weak.” It was announced through the program that an evening message would be from 2nd Thessalonians 3:15 with a message title of “Admonish him as a brother.” Calvary weekly supports a missionary project under the title of “Missionary of the week.” This weeks support was directed to the Roger D. Blevins ministry as I mentioned earlier. One of the Pastor’s prayers called for the Lord to fill the church with spirit. He asked that the Lord would transform their church and of course much more in the name of Jesus. Pastor Ryan said that we should do what we can for each other when we can. It is the responsibility of the church to help those who are weak. We are not all at the same place in our lives. He said that he had been raised up in the church but that he could not have the same expectations of others who were not. I expect more of an adult than I do of a six year old boy. The question has to be asked, “how do we bring them along.” How do we help those who are weak? Everyone along the way needs a little encouragement. He discussed some verses from Ephesians. He said that we should be strong in the Lord and the power of his mind suggesting that all should be strong in the power of Jesus Christ. Later in his message he said, wasn’t it God who said that through him all things are possible. He emphasized that our strength comes from him and that his grace is sufficient. Also he commented that I want the power of God in my life saying, “there is no Pastor in the world who could handle all the things the world will throw at you, without the Lord.” Though we may be weak in the flesh, we can be strong in the Lord. We should all help and encourage others to be with the Lord. He concluded with a statement that we are all weak without the Lord and that we should be strong in the grace of Jesus Christ. In his closing prayer he asked the Lord to keep us ever mindful in giving us the strength we will need. Following his sermon there was communion. It was a wonderful day visiting the Calvary Baptist Church, meeting the very friendly folks there and seeing this extraordinary architecture treasure. Go to their church and see it for yourself. As believers, let us share the good new of Jesus Christ as Savior of the World! Each one reach one! See ya in church!